Chock-full of apples, this is a favorite fall birthday cake. Though I'm sure it would be good without it, the frosting — reminiscent of maple-bar icing — is awfully tasty. Preheat oven to 325 degrees. Butter and flour a 9-inch-by-13-inch baking pan. Make the cake: In a large bowl, mix together flour, baking soda, salt, and ground spices. In a mixer bowl, or with an electric mixer, cream together butter and sugar until light and fluffy. Add eggs and mix for another minute, until the eggs are blended into the butter and sugar. Reduce the speed to low and add flour mixture, a third at a time, just until the dry ingredients are incorporated. The batter will be very thick and stiff. Spoon the batter into the prepared pan and smooth the surface with a spatula, pushing the batter into the corners of the pan. Bake for 40 to 50 minutes. When the top of the cake is firm and an inserted toothpick comes out clean, the cake is done. Cool on a wire rack. Make the frosting: In a small saucepan, melt the butter. Add the salt and brown sugar and stir over medium heat until the sugar melts. Add the milk and bring the mixture to a boil. Remove pan from heat and pour contents into a medium bowl. Cool for 10 minutes. Add powdered sugar and vanilla or maple syrup and stir until well blended. 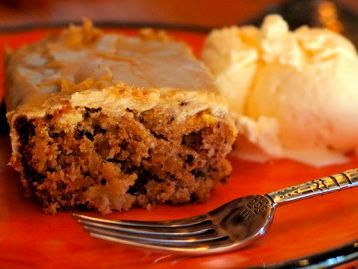 Spread frosting on cooled apple cake. Cut into squares to serve.